This Monday I have the day off and I’m going to spend it in casual attire, dreaming that I’m on a hot beach. Imperial Valley Dress, $78 at Quicksilver. Marc by Marc Jacobs R Special Tote, $360 at Zappos. Chan Luu Orange Jade Necklace, $178 at Nordstrom. Herbal Macrame Tie Sandals, $40 at Topshop. For Memorial Day weekend my husband and I were invited to our friend’s beach house in Bodega Bay. I am seriously looking forward to relaxing on the beach, barbecuing and catching up with old friends. 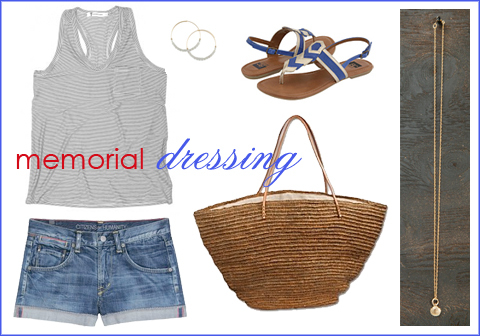 And three days of beachside holiday weekend means three days of beachside outfits, so here are my picks! Juicy Couture Embroidered Cotton Dress, $280 at Net-A-Porter. Havaiana Slim Flip Flop in Light Golden, $24 at Boutique to You. Designers Remix Beach Bag, $110 at SSense. Wendy Nichol Black Diamond Spike Necklace, $368 at SHEboutique. La Mer Waterproof Watch, $60 at Urban Outfitters. Aqua Stud & Mirror Bangle Set, $28 at Bloomingdales. Milly Crochet Cotton Beach Dress, $195 at Net-A-Porter. Emmanuelle Khanh Plastic Sunglasses, $137 at Farfetch. Milly Ikat Print Bikini, $110 at The Outnet. 7 For All Mankind Jane Espadrille Wedges, $220 at Shopbop. Gap Floppy Straw Hat, $30 at Gap. Citizens of Humanity Wyatt Shorts, $343 at My Theresa. T by Alexander Wang Striped Classic Tank, $80 at Kirna Zabete. BC One For the Road Sandals, $51 at Zappos. Sea of Love Mini Shell Charm Necklace, $138 at Madison LA. Alex & Ani Rush Endless Hoops in Coconut Cream, $58 at Max & Chloe. Raffia Crochet Bag, $62 at Athleta.